And now the race in the Old Dominion. For starters, there's no doubt that McDonnell has a lead in this race, but this result is well outside of the margins we've seen in any other poll (other than the Daily Kos poll around the same time as the first Survey USA poll) in the time since Deeds got the Washington Post's endorsement in the Democratic primary race in May (when Deeds became viable as a general election candidate). This is definitely a Republican-laden sample. I don't know that the 38/32 Republican to Democratic split in the sample is all that uncharacteristic of Virginia. It is probable that such a sample could be drawn there, but it still feels a bit out of the ordinary. My point is driven home by the "who'd you vote for -- McCain or Obama" question. The split there was 52/43 in favor of McCain -- in a state Obama won 53-46 last November. 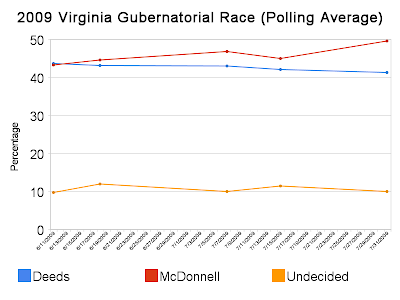 You may also notice that McDonnell has jumped out to a fairly sizable lead in FHQ's weighted average of the race. 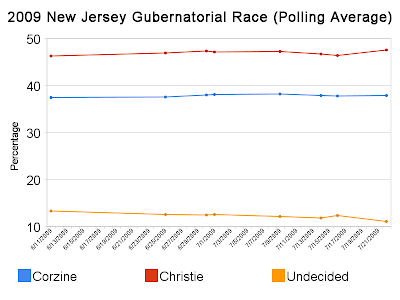 Meanwhile, Chris Christie has maintained about a ten point advantage over Jon Corzine in the New Jersey race despite the fact that Christie has been above that margin in quite a number of polls recently. The difference between races is the number of polls conducted. There have been far more polls in New Jersey than in Virginia and that translates into more volatility in the Virginia numbers. The Virginia race, then, is more vulnerable to outliers like the one this Survey USA poll represents. Regardless, in these two races, the polls this week have had a Republican flavor with both candidates stretching their leads over their Democratic competitors. Let's play some catch up on the 2009 governors races. First, New Jersey. On Tuesday, Public Policy Polling released its first batch of new numbers for the race in the Garden state since late June and not much has changed. The Republican held steady around the 50% mark in both the June and July iterations of the poll, but incumbent governor, Jon Corzine, dipped from what had been his high water mark in the June poll (41%) all the way back to 36% in July. And no, PPP doesn't ask a question with independent Chris Daggett included. In other words, this is Corzine's position before Daggett is even considered. 1) PPP is seemingly the only polling outfit still using a sample of registered, and not likely, voters in this race. I don't think that Corzine would have gained all that much on Christie if likely voters had been sampled, but there could have been some differences. If anything, though, the spread in the poll likely would increased in a likely voter sample given the state of the race. 2) Another thing to eye here is that the sample size from PPP's June poll (1094 registered voters) was cut in half in this poll. Again, this isn't a killer for the poll, but it is a noticeable difference from the June poll that could explain some of the changes witnessed. 3) The 1977 Brendan Byrne comparison may be dead. The position the former Democratic governor was in 1977 was more advantageous than Corzine's now (among registered voters). With less than 100 days left in the race, it is incumbent (no pun intended) upon Corzine to mount some sort of charge. As it is now, he's headed in the wrong direction. Well, FHQ is off to North Carolina. After over 650 posts in Athens, GA, it is time to bid adieu and move our head quarters to Virginia Foxx's 5th congressional district in the Winston Salem area of the Old North State. Fare thee well, Classic City. You've been good to us. There's nothing shocking about these results. 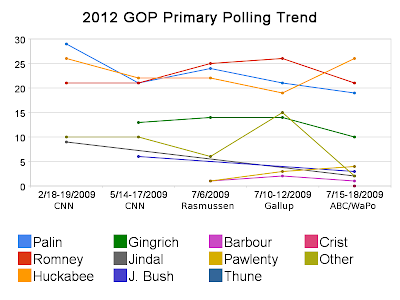 As most of these polls have demonstrated, Romney, Huckabee and Palin lead the pack. However, we can also glean from the inclusion of Giuliani among the list of candidates, that name recognition probably matters an awful lot. The former New York mayor and Newt Gingrich are below the trio at the top, but above some of the lesser-known candidates and those named Bush. As I've continued to say, there are some well-formed options at the top, but some of the other options are not as well-defined at this point. Tim Pawlenty seems to be signaling a presidential run both by not seeking a third term as Minnesota's governor and by assuming the vice chair position within the Republican Governors Association. I suspect we'll see Pawlenty's name rise over the course of the next couple of years. Everyone else is stationary for the most part since the May poll by Fox. Interestingly, those responding that it is too early to tell rose from 7% to 10%. The premise: Small states go first, large states go last. The rules: Iowa and New Hampshire receive an exemption to continue going at the front of the pack. 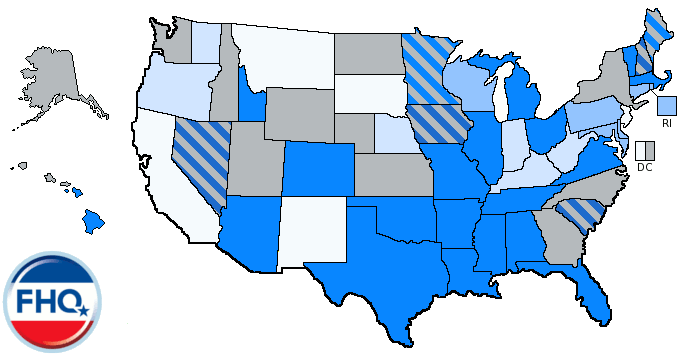 Following the lead-off, the ten smallest states hold simultaneous delegate selection events (primaries or caucuses) with the remaining states are split into three groups based on size. If the smallest states were to go during March, the small-to-medium states would go in April, the medium-to-large states would go in May and the largest states would bring up the rear in June. States could not go any earlier than their designated month, but could opt to hold a later contest if that was the custom in the state. The history: This plan in its original form made some headway during the 2000 election cycle within the Republican Party. Its advance was quashed at the GOP convention that year to avoid a floor fight over the issue. The plan was later altered to provide Iowa and New Hampshire with the exemption depicted in the map above. Without that exemption, New Hampshire would end up in the group of smallest states while Iowa would hold its caucuses during the month designated for the small-to-medium states. The pros: The Delaware Plan (modified or otherwise) would allow for retail politics and the potential for the building of a grassroots candidacy (during the election year). That is intended to maintain a certain level of competition in the process. The cons: Obviously, densely populated areas are disadvantaged by this plan, and thus urban issues are potentially secondary in such a campaign (What kind of nominee does that produce?). Also, states organized by size are not all clustered together. That would potentially have the effect of advantaging the candidates with the most money to organize in and visit each of those states (Would that produce a result any different from the current system?). The big news this week, at least for regular readers, is that FHQ is hitching up its wagons and moving this week. I have no idea how big a damper this is going to put on the flow of posts around here, but I can speculate that it will probably be down at least somewhat until the new FHQ HQ is up and running. So bear with me. Some residual work from last week's Presidential Primary Reform Week series should surface at various point. PPP is polling the New Jersey governor's race this week. Those results should be out Tuesday, and that's great, but they also plan to ask about the "potential impact of Barack Obama and Sarah Palin coming to the state to campaign for their party's gubernatorial candidates" would have. Now, I'd be willing to bet that there is a New Jersey 2012 trial heat question somewhere in there too. Call it a hunch. Finally, we left off in a similar post last week talking about the Sotomayor confirmation vote. This is the week for that, though. The same rules apply: Who will vote for her? Who will vote against her? And will that have future electoral ramifications for members of the Senate? Some members are already out with their decisions (ruining the fun), but others are holding on to their choices (and also ruining the fun because the choice is known). And I'm sure there will be some surprises along the way as well. This is part five in a series of posts this week dealing with presidential primary reform. As a refresher you can also look at FHQ's earlier synopsis of several of the various reform proposals that have been talked about and/or considered. The maps are a little clunky, but will suffice for now. I'm planning a revamping of them in the not too distant future. You can also find part one (National Primary with a Twist) here, part two (Two Birds, One Stone) here and the first installment of part three (Fair and Representative Presidential Primaries Act of 2009) here (second installment here). Finally, part four (covering the implications for reform based on the National Association of Secretaries of State change-over of power) can be found here. I wanted to close Presidential Primary Reform Week with a heads up on some great reading out there on the subject. Yes, if you've tuned into this series of posts since last Monday, you've already been given a lot to look at and read, but there are a couple of books (one already out and one to-be-released book) that are on my wish list for the near future -- in times that are less dissertation-dominated. The first book is an edited volume -- Reforming the Presidential Nomination Process by Steven S. Smith and Melanie J. Springer -- that the Brookings Institution released earlier this year. In fact, a made a similar claim about this book being on my wish list about a year ago before it hit the shelves. Eerie, isn't it? The entire process is seemingly broken down, but the book ends with chapters from Larry Sabato calling "reform by constitutional amendment," Thomas Mann dissecting the reform fallout from 2008 and Dan Lowenstein discussing congressional intervention in the process. I've mentioned the Lowenstein chapter before and it bears mentioning here again. It is the piece that breaks the system of reform down from a legal perspective and has the most usefulness for our discussions here. Highly recommended reading. "Many people complain about the complex system used to nominate presidents. The system is hardly rational because it was never carefully planned. Because of the dissatisfaction over the idiosyncrasies of the current system, periodic calls arise to reform the presidential nomination process. However, the last major series of reforms from the 1970s produced many unintended consequences. Further, many of the current reform proposals are actually solutions for lesser problems and solutions for more major problems are highly unlikely to be enacted. The main theme of the book is to be careful what you wish for. Reforming the presidential nomination process is as complex as the current system. 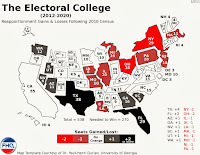 In this book Norrander explores how presidential candidates are nominated, discusses past and current proposals for reform, and examines the possiblity for more practical, incremental changes to the electoral rules." "Be careful what you wish for." Sounds like something uttered around these parts. Anyway, both of these books get FHQ's seal of approval. If you're interested in learning more about the process, you probably won't have to look any further. Happy reading. Home renovations like the ones FHQ did in mid-May can put a damper on your 2012 poll-watching in a heartbeat. And apparently my blogger-turned-handyman days caused me to miss one of the 2012 GOP primary poll conducted by FOX [pdf] during that period. Sadly, with Giuliani and Sanford now tacked onto the list of candidates, the key took up too much room and the color scheme Google Docs provided was repetitive and confusing. In sum, that was not really a workable order. The key is now gone from the figure and the names are added nearby the lines or points they correspond to. Most of the color issues were moot once I withheld the "other" line. It matched nearly identically the color given to Jindal's data. The other change is that I've added in the element of time. Everyday is accounted for in the series now so that it doesn't appear as if each poll is equidistant from the next. Before I close, I did want to mention one other issue with this FOX poll and the poll ABC and the Washington Post released this morning. In each case, we are talking about a 2012 primary question that is based on the responses of less than 300 Republicans (and/or Republican-leaning independents) nationally. When the goal is 1000, less than 300 respondents has the effect of REALLY ramping up the margin of error. In the process, the representativeness of the poll is made all the more questionable for something that is already well in advance of primary season (or even the competitive tail end of the invisible primary for that matter). As I've said recently, I like seeing these numbers and I enjoy seeing the trends, but these things absolutely have to be taken with a grain of salt. And occasionally I like to fold in some discussion of fundraising or organization, but I try to avoid claims like these at all costs. To assert that Huckabee leads this race or that it is beneficial for Romney to "draft" behind Huckabee is patently ridiculous. Given the margins in the polls conducted so far, Romney and Huckabee are tied (with Sarah Palin). Now, it could be that the perception that Huckabee is ahead is helpful to Romney in that "everyone else" is gunning for the former Arkansas governor and not Romney, but still. Let's just watch these numbers come in and not over-interpret them. ABC News and Washington Post have a new poll out that the blogosphere is jumping on to trumpet the decline of Sarah Palin's favorability. Yeah, FHQ won't be jumping on that bandwagon, but we will discuss the 2012 Republican primary question that was nestled deep in the results. [For the record, the Palin numbers reflect opinion of her among folks of all partisan stripes. The Republican ones are the only ones that really matter at the moment.] Yes, the usual cast of characters are represented,* but I like the fact that the names of prospective GOP candidates whose names were volunteered (not on the list of candidates named) were included in the results as well. Among that group -- which included Charlie Crist, Bobby Jindal, John Thune and other -- Jindal did the best, pulling in about 2% among Republicans and Republican-leaning independents. Both Crist and Thune garnered less than a percentage point each. First of all, this figure is getting a touch messy with the inclusion of Thune and Crist. Even still, the same pattern we've seen in these polls reemerges here: the Huckabee/Palin/Romney trio continue to be clustered relatively close together, outpacing all other possible candidates. [And it should be noted that that pattern surfaces with just 292 GOP/GOP-leaning respondents nationally. So take this poll with an extra grain of salt -- this question at least. The margin of error among that portion of the sample is likely pretty high.] It just so happens that the former Arkansas governor is getting another turn at the top. I wouldn't read too much into Huckabee's showing (or anyone else for that matter), but I will take the opportunity to say that if last year's delegate runner-up for the GOP nomination is serious about a repeat bid in 2012, he is going to have to get a move on. From a polling perspective, he's fine, but financially he's quickly falling off the pace being set by his leading counterparts' political action committees. 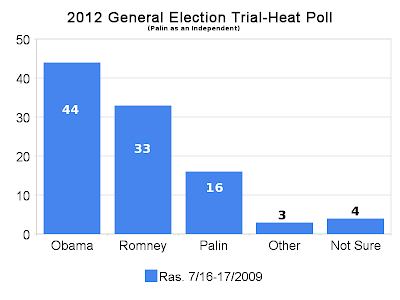 Both Romney's Free and Strong America PAC and Palin's SarahPAC are doing quite well in the first half of 2009. Huckabee, on the other hand, has yet to report any numbers for his Huck PAC, and that fact in conjunction with the news that the PAC is undergoing some restructuring, is a troubling start. Again, this is all extremely early. As John McCain demonstrated during the 2008 cycle, campaign restructuring and dire financial straits aren't necessarily dealbreakers. However, 2012 won't be 2008 for the Republicans. They are facing an incumbent Democrat in the White House and will likely be looking for someone who has some gravitas among the elites within the party and an ability to raise funds and lots of them. Romney meets both those criteria the best at the moment. Palin lacks the internal party connections and Huckabee trails on both fronts. The main question now is whether 2012 will be like 1996 or 2000 for the Republican Party. Will they have a fairly active primary campaign like in 1996 or will most of the party quickly coalesce around a candidate as in 2000? Part of the problem of assessing that question is that we have reached something of a crossroads on the divisive primaries/parties question. The pre-2008 thinking was that the quicker you line up behind someone (thus avoiding drawn-out divisiveness), the better your chances are in the general election. Post-2008, though, the thinking is slightly different. Can a drawn-out, yet not personally divisive nomination battle actually help a parties nominee from an organizational standpoint? 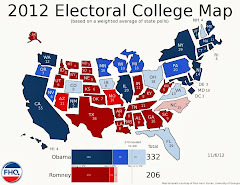 Obama's narrow electoral college wins in Indiana and North Carolina are often cited as evidence that the primary campaign organization helped in the general election. My (two and a half years in advance) guess is that the GOP may pay some lip service to the organizational idea, but will ultimately make a quick decision on the 2012 nomination. And I should note that I've been talking about this as if the party has complete control over this. They don't. Conditions have a large say in the matter. Democratic primary and caucus voters were evenly divided in 2008, but Republican voters may not follow suit in 2012. That potential is there (Palin grassroots vs. Romney establishment, for example), but, as I said, I think it is more likely that a consensus forms around one candidate. If the GOP elite signal in a way similar to 2000 with Bush, that they are solidly behind one candidate, then it will be difficult for anyone to disrupt the inevitability story. All that from a poll of 292 Republicans and independents leaning Republican? Yeah, I know. *The list of candidates included Haley Barbour, Jeb Bush, Newt Gingrich, Mike Huckabee, Sarah Palin, Tim Pawlenty and Mitt Romney. This is part three in a series of posts this week dealing with presidential primary reform. As a refresher you can also look at FHQ's earlier synopsis of several of the various reform proposals that have been talked about and/or considered. The maps are a little clunky, but will suffice for now. I'm planning a revamping of them in the not too distant future. You can also find part one (National Primary with a Twist) here and part two (Two Birds, One Stone) here. Today's post isn't so much about breaking new ground as it is about relaying some recent news that has been, to this point, lost in the shuffle. Two weeks ago, Senator Bill Nelson (D-FL) re-introduced the bill (with Michigan Senator Carl Levin as a cosponsor) that he put before the chamber during the first session of the 110th Congress (2007) and attempted to raise awareness of during heated negotiations over the Florida/Michigan situation in the Democratic nomination process of 2008. S.2024 lapsed when the 110th adjourned and would have established an interregional primary lottery system. As of July 9, that same plan was back, but in the form of S.1433, the Fair and Representative Presidential Primaries Act of 2009. But what exactly is an interregional primary lottery system? Let's take a tour, shall we? This is the plan that has been introduced in Congress. It divides the nation into six regions and splits primary season into six contests that are three weeks apart beginning in March and ending in June. Under this plan, Iowa and New Hampshire lose their favored, early positions. The contests are not simply made up of the regions though. There are six contests, but a lottery determines what week anywhere from one to four states from each region will hold their contests. The map below shows one possible way that a lottery could split the states. The fifth week (in brown), for example, takes one state from each region: New Jersey from the Northeast, North Carolina from the South, Maryland from the Border states, Illinois from the Upper Midwest, Louisiana from the Southwest, and Oregon from the West. Believe it or not, the Michigan-based plan has Michigan going during the first week of the process during the first iteration. Regardless, the bill is active and we have the means of tracking its progress (or lack thereof) from here on out. *I say tangential because it is an open question as to whether Congress would even have the ability to intervene on this issue. But I'll have more on that on Friday. Should Jindal run in 2012? These aren't terribly surprising results. As the poll discovers, Jindal is very popular in the Pelican state (55% approval), but the governor earns a smaller share of support than John McCain received in Louisiana last November. Coincidentally, Obama's stood pat at 40%, while support for the Republican candidate dropped from 59% (McCain) to, in this poll, 54% (Jindal). Of course, the answer to that trial heat question was probably at least somewhat conditional upon the answer to the "should Jindal run in 2012" question two questions earlier on the survey. Three out of five respondents answered no. That may have enforced some lag on the popular governor's support against Obama. Meanwhile, in the never-ending quest to answer the Palin question, PPP found the former vice presidential nominee ahead of President Obama, but not as far ahead as the state's own governor. Again, favorability seems to be driving the difference between the Republicans. Only 46% of the respondents in this poll saw Palin in a favorable light (versus 42% unfavorable). Interestingly, Jindal bests Obama among women while Obama continues to lead Palin (in another poll) with that group. This morning, Strategic Vision released the numbers from a survey of New Jersey. For Chris Christie, the results of the gubernatorial trial heat are another feather in the Republican's cap. But for Jon Corzine, they offer yet another ominous sign. Sadly, there are no attendant crosstabs, so digging down can only go so far. However, here are a few thoughts. This is the first poll since independent candidate, Chris Daggett was added to the questioning that Christie has cleared the 50% barrier. 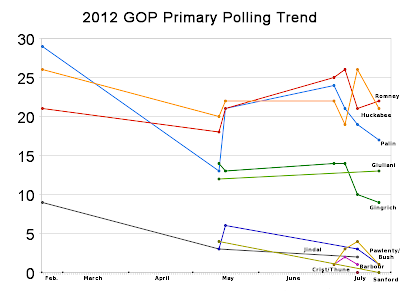 In fact, the Republican has not topped that mark since the calendars were flipped to July. To break through, then, and hit the highest point he has had throughout all the polling conducted on this particular match up since the beginning of the year is telling for Chris Christie. Of course, the flip side of this result is that, at 4%, the undecideds are at their lowest level of any poll as well. But those sorts of fluctuations are why FHQ applies its weighted average to the polling results. 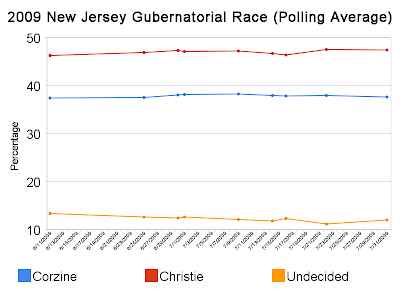 Christie did jump (over a point) in the average to extend his lead over the incumbent Democrat to nearly ten points. [And incidentally, the undecideds are sitting right around the 11% mark when averaged. Sure, but doesn't that include the data from polls where the undecideds were over 20 points back in the earlier part of the year? Yes, but the graduated weighted scheme takes care of that. 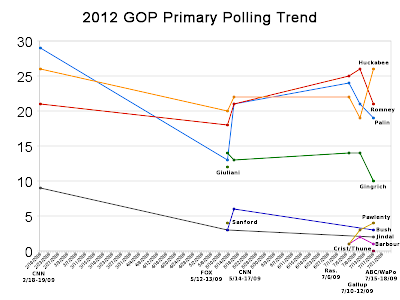 For transparency's sake, however, if we look at just the polls conducted since the New Jersey primary on June 2, that number drops to about 8.5%. In other words, still above the 4% we see in this current Strategic Vision poll.] If we look at just the polling done since Christie's primary victory, the Republicans advantage grows to just 10.5 points. Christie, then, is ahead and comfortably so at that. But what about Corzine? The thing that is most troubling for the incumbent is that he is seemingly stuck in a rut. There has really been no movement in his numbers -- good or bad. The governor has settled into the 37-41% range and hasn't really budged. That tempts me to stop making comparisons between this race and the Brendan Byrne comeback victory in the 1977 gubernatorial election. At a similar point in that race Byrne, trailed his Republican opponent (Raymond Bateman) 53-36 among likely voters. Eerily similar, right? Yes, and even though there was only scant polling in that 1977 race prior to that point in July, the fact that Corzine has basically not moved all year -- other than his March swoon -- is troubling to say the least. It is still relatively early in this race (most voters may not be paying attention yet), but not as early as it once was. Just to throw another number out there, Obama's approval in New Jersey in this poll was right at 50%. This is part two in a series of posts this week dealing with presidential primary reform. As a refresher you can also look at FHQ's earlier synopsis of several of the various reform proposals that have been talked about and/or considered. The maps are a little clunky, but will suffice for now. I'm planning a revamping of them in the not too distant future. You can also find part one (National Primary with a Twist) here. Two Birds proposes a package of reforms that would pivot the Public Funding System away from its current emphasis on spending limits and retool it to combat frontloading in the presidential nomination process. The proposed reforms include: (1) delaying the System's matchable-contribution and disbursement dates until October 1st of the pre-election year and April 1st of the election year, respectively; (2) forcing candidates to compete for a single pool of funds, with no guaranteed maximum or minimum amount; (3) transforming the general-election grant into a matching-funds program, similar to that currently used during the primary-election period; (4) eliminating the grant to political parties for national conventions; and (5) creating new, unconventional benefits for public funding participants, such as automatic ballot access. First of all, if you thought the FairVote plan discussed yesterday was ambitious, it has nothing on Matt's plan to overhaul not only the presidential nomination process but to fix campaign finance as well. Also, there's more to it, but for our purposes I'll try to focus on just the frontloading and presidential primary finance mechanisms. If you have thoughts on the other portions of the proposal feel free to sound off in the comments section. 1) Move the matchable contribution date from January 1 to October 1 in the year prior to the election and move the disbursement date from January 1 to April 1 of the election year. I can buy that. If contributions are not matchable until the October prior to primary season kicking off and matching disbursement checks are not handed out until April of the election year, then participating candidates would be unable effectively campaign in many states earlier than April. As such, states would be motivated to shift to a point in the calendar when candidates would and could actually pay them some mind. That's all well and good, but how do you get candidates to opt in? That's the big question, right? Fixing frontloading, as detailed here, can only be fixed if the major candidates accept the terms of the enhanced system. 2) Well, that piece of the puzzle is dependent on a handful of factors. First, the stick. If you opt in as a candidate, you are in for both the primary phase and the general election phase. None of this opting out for the primaries and crawling back in for the general election (see Bush, George W., Kerry, John and McCain, John). But there's also the carrot (multiple ones actually). First, participating candidates can take advantage of a cap-less pool of money and can do so to the detriment of their opponent. That is, instead of the $160+ million cap on 2008 general election funds for example, there would be no cap. On top of that, if you raise more than your opponent, you get more than your opponent. Furthermore, if your opponent goes it alone outside of the proposed system, you get everything in the pool. Oh, and there is a 4:1 matching fund ratio to sweeten the deal. No, it isn't. But the one problem I have with all of this is this: What if, as a candidate, you know you can out-raise your opponent and what he or she can gain from the new system? Even if Barack Obama had ceded the entire $168 million in federal money to John McCain in 2008, the then-Illinois senator still would have been able to out-raise/out-spend the Arizona senator. But that's somewhat underhanded of me. This system applies to both the primaries and the general election. Obama didn't necessarily know in February 2008 that he could outdo McCain financially in the general election. He would have been more concerned with Hillary Clinton at the time. More to the point, he would have been interested in how he'd stack up financially compared to the former First Lady. Would the promise of matching money in the fall have been enough pie in the sky to bring Obama to the table in the Two Birds-One Stone system? Perhaps. Here's the thing: The more I think about this, the more I think of how perfectly it would have worked in the 2008 environment. But what about other elections? If you're an incumbent and see a close election on the horizon, maybe you'd jump in (Bush 2004), but if you saw a comfortable win coming, you might just as soon opt out (Clinton 1996). Well, that's a fair number of elections right there. It is and we haven't even tackled the open seat elections. Opting in in those cases would be conditional as well, though. In 2008, sure, this system likely would have worked. I can see Clinton and Obama and McCain opting in. But in 2000, I don't think so. Gore and Bush were heavy favorites and would have quickly eschewed the parameters of this system. Both were comfortable frontrunners who were fine with the status quo in both the primaries and general election. The key would be getting this up and running and strategically, you'd be better served doing it ahead of an open seat presidential election with no clear frontrunners. Maybe that's 2016, maybe it's not. But you would face a major obstacle in pushing this when an incumbent who can raise lots of money is running for reelection and can shun the system. Of course, I have Obama in 2012 in mind as I'm writing this. But that money could very well dry up to some extent if the economy isn't trending in the right direction by then. But if the candidates don't buy in, then we're right back to square one with campaign finance and frontloading. 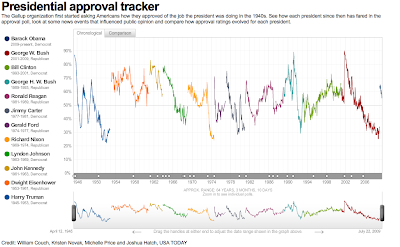 If you haven't seen it already, USA Today has a neat little gadget up today using Gallup data that allows you to track President Obama's approval rating and compare it to past presidents all the way back to Truman (when Gallup's efforts commenced). You can zoom in and out on the time series by moving the handles at the bottom of the graph and you can also compare presidents side by side. This has already been used as fodder among the political class (believe it or not). This one is worth keeping tabs on as we approach next year's midterm cycle, and obviously, 2012. Hat tip to Josh Tucker at The Monkey Cage for the link. Tucker, by the way, is calling on those who frequent TMC (read: political scientists) to put Obama's current position and the honeymoon effect generally into context. We were all treated to a double helping of 2012 general election presidential polling today (...if you like that sort of thing.). Public Policy Polling's numbers were expected, but Rasmussen had some numbers on prospective match ups between Obama and Palin/Romney as well. One of my complaints last week about the 2012 trial heats was that only PPP had conducted any thus far in the admittedly (very) early stages of 2012 election cycle. If you are going to conduct polls this early, it is nice to know that you have more than one polling outfit to lean on. Enter Rasmussen, who polled Romney and Palin against Obama in addition to PPP's now fourth iteration of their Gingrich/Huckabee/Palin/Romney versus Obama survey. The one thing that I want to note before I jump into looking at the results of these individual match ups is that the sample sizes between these two polls are vastly different and that may say something about the reliability of each organization's numbers. For a national poll the standard sample size is something at or around 1000 respondents. Rasmussen had exactly that, but Public Policy Polling had but 577 respondents. As I mentioned last week in my piece on the 2012 polls, PPP has come under that 1000 respondent mark three of the four times they've done these 2012 surveys (or four out of five counting the Obama/Palin survey that initiated the series back in March). Are these reliable numbers? Other than the May poll that had 1000 respondents, there has been a general closing of the gap between Obama and his would-be challengers since April. That tracks well with the president's overall decline in approval and favorability over that period of time. But are the results reliable? Seemingly, but certainly not as reliable as the more robust sample from Rasmussen. Here's an example: GOP12 points out that PPP breaks favorability and the hypothetical trial heats by region. Interesting, right? Yeah, until you look more closely. Obama sweeps all four Republicans in the South! What!?! The president also wins across the board in the northeast (not surprisingly), loses to Gingrich and Huckabee in the midwest and is vulnerable in the west against Palin and Romney. Normally, a lightbulb would go off for me there. 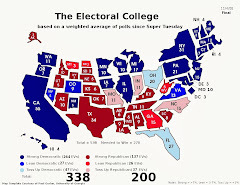 "Hey, why don't we try and project that onto the electoral college, just for fun (I still might do this. Ha!)?" But those numbers in the South give me pause. * As I lamented on Friday, it would have been nice to have seen what the non-May numbers would have looked like in those PPP polls had each had the standard sample size. At the end of the day, a 577 respondent sample would be solid for a poll here in Georgia, but on the national level, not so much. 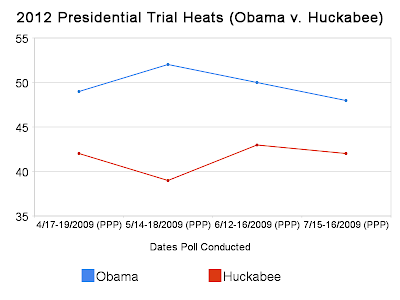 ...Mike Huckabee in the Rasmussen poll all the more surprising. Again, Huckabee, Palin and Romney have all traded off handling the top honors for "best against but still trailing Obama" in all of these polls thus far. And they have all clustered together and well above all others save Gingrich for the duration of these surveys as well. Nonetheless, Huckabee was not included in the Rasmussen questions. The former Arkansas governor was, however, a part of the PPP survey. And whereas both Gingrich (41 to 42) and Obama (49 to 50) rose this month over last, Huckabee (43 to 42) and the president (50 to 48) both saw declining shares of support in the July poll. I don't find that that is anything to write home about, though. 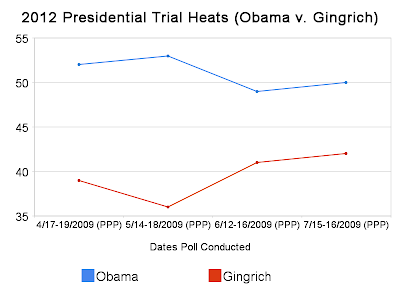 Again, like the Gingrich numbers, these just serve to validate the status quo in this match up. As we move into the Palin and Romney results, we can begin to compare and contrast how the Rasmussen and PPP polls stack up against one another. Both polls show the soon-to-be-former Alaska governor rising as compared to last month's PPP survey, but the July PPP poll shows greater improvement than does Rasmussen. Regardless, the improvement continues to indicate that Palin's July 3 resignation announcement has not necessarily hurt her in terms of polling (2012 or otherwise). 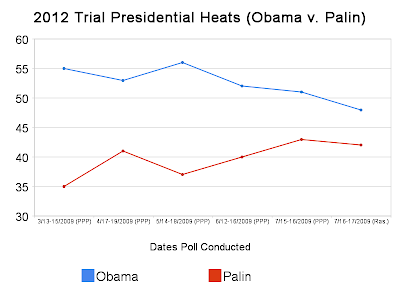 Given the question marks surrounding the PPP poll outlined above, if we take the Rasmussen results, we see that Obama is under the 50% mark against Palin for the first time in any of these trial heats. That's a far cry from the 55/35 split from PPP favoring the president in March. It just goes to show you how quickly the political outlook can change. And yes, that should serve as a not of caution concerning these polls. It is still very (VERY) early and much can change between now and next year's midterms, much less 2012. 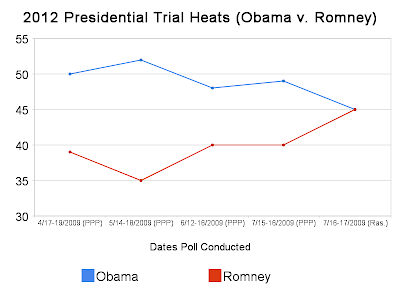 The result that will catch everyone's eyes from these two polls is the Obama/Romney split in the Rasmussen poll. The 45-45 tie is a remarkable sign of the current position the president is in: precarious given the typical, early term highs in January and Februrary. Still, this is a widely divergent result compared to the nine point advantage Obama has in the PPP survey (49-40 -- no decided change from last month). Now, I've certainly already called into question the sample size of PPP's poll, but without the Premium Service (I'm cheap, not to mention poor.) from Rasmussen, I don't know that it is fair to compare these two polls. Upon seeing the results, I'd wager that the Rasmussen poll has a few more Republicans in its sample than does the PPP poll (42% Democratic, 35% Republican and 23% Independent/Other). Again, these polls are all verging on the premature, but the real take home message from them is one you can easily glean from Obama's approval and/or favorability numbers: The president's support is dwindling. Obama is still fine among Democrats, but has virtually no crossover appeal and is seeing his advantage among independents evaporate like a small rain burst on a late July afternoon in Georgia. There's still something there, but it is certainly less than what it once was. Just for fun, let's look at the three-way general election race with Palin as an independent. If John Sides hates 2012 polls, then I'm sure he'll just love a poll that takes two hypothetical steps to even get to. First of all, Palin has to lose the GOP nomination (one she hasn't even announced she's running in) to Romney and then has to decide to run as an independent. That's almost hypothetical enough in 2009 to make me queasy. And that's saying something! Understandably, this type of three person race negatively affects the Republican Party's fortunes in a prospective 2012 general election. Obama remains stationary at a shade under 50% (Well, maybe more than a shade for an incumbent president.) while Palin pulls enough away from Romney to give the president a comfortable enough edge (11 points) over the former Massachusetts governor. Mitt's already been tweeting about the Rasmussen results, but here's betting he won't be trumpeting these three-way results. Well, he won't until he asks Sarah Palin to be his running mate and has an affirmative answer anyway. I may have given Rasmussen another idea for a poll question there. *For the record and given the crosstabs, there would have been 196 respondents from the South, 138 from the northeast, 150 from the midwest and 92 from the west. I honestly don't know if those numbers are going to yield representative results for those regions much less the nation in the aggregate. For a more in-depth look at this poll and the Rasmussen survey also out today, see here. For a more in-depth look at this poll and the Public Policy Polling survey also out today, see here. This is part one in a series of posts this week dealing with presidential primary reform. As a refresher you can also look at FHQ's earlier synopsis of several of the various reform proposals that have been talked about and/or considered. The maps are a little clunky, but will suffice for now. I'm planning a revamping of them in the not too distant future. 1) Coordinated action. This is another idea that will require coordinated effort from both national parties. I don't see this as the monumental roadblock that I once did. Folks from both sides seem to be mindful of the fact that now is the time to hammer something meaningful out on reform. Of course, one man’s meaningful is another man’s useless. 2) $$$$. The idea of moving congressional primaries to coincide with the national primary is ingenious. It is also imperative. Without that, states would be confronted with footing the bill for another (separate) election. I’m not sure, but I’m fairly certain that this current period is not the proper time to be pushing an additional election to be paid for with taxpayer money. Call it a hunch. The other side of this is that it probably wouldn’t just be congressional primaries moved but all primaries. And there may be some complications there because that would obviously include state legislative primaries (in most states). If any perceived negative impact surfaces there, state legislators — the folks primarily tasked with initiating these election date changes — may put their own self interests above the national party’s. Now, what could be seen as a negative impact to state legislators? First and foremost, the most problematic aspect is turnout. Some legislators might prefer lower turnout primary elections. Those conditions are to their advantage, after all. 3) Delegates/conventions. One major piece missing from this puzzle is the delegate calculation. What effect does the national primary have on the allocation of delegates? Are the state contests merely just the first round (beauty contests)? Does the national primary determine the allocation of all the delegates or just a certain percentage? And finally, what does this do to the convention? I suppose the same rules apply, but this national primary idea has an air of finality to it. "The delegates are allocated. Let the general election begin!" This last point is a minor issue. If this plan was instituted, the parties, I'm sure, would go on having their conventions as if nothing had happened. It isn't as if the conventions have been decisive of late (though they could have been in 2008 if Hillary Clinton had kept her campaign going throughout the summer). 4) Candidates. What does this plan do to candidate strategy? Would candidates drop out as they do in the currently configured system? Super Tuesday does have a way of winnowing the field down to (usually) one candidate. But I don't know. Candidates may opt to tough it out. After all, the candidate who places second at the end of all the primaries and caucuses moves on to the runoff national primary. Money would be the determining factor there, though. If you don't have any money you can't go on. What a national primary like this does accomplish, though, is basically a reset. Things kinda sorta go back to the way they were prior to the McGovern-Fraser reforms in one respect: there's a prize at the end of the calendar. Look at the allocation of Democratic delegates in 1976. The date on which the most delegates were at stake was the last one on the calendar. This proposed system, however, would have all of the delegates (it seems) at stake on the final date. In that regard, some of the same dynamics that prevailed in the earlier iterations of the McGovern-Fraser system would return in the revised system. Mainly, that would mean that, sure, candidates would drop out as they do now (when they aren't catching on), but it would also potentially mean that you would have candidates jumping in the contest midstream (depending on how frontloaded the calendar is -- If the calendar is like 2008, it wouldn't have made sense for, say, Jeb Bush to have jumped in after Super Tuesday's delegate giveaway. There likely wouldn't have been enough delegates left to counter McCain's lead after February 5.) as well. Essentially, then, this proposed system would offer two opportunities for buyers' remorse: once by giving a late-arriving candidate a chance to catch on and then again in the national primary when the second place finisher goes against the frontrunner (the winner of the most contests). I don’t know that any of these things are deal breakers, but I do think they are factors that would have to be ironed out to some extent to avoid any unintended consequences. And despite the fact that I often come down hard on these reform plans, what I ultimately want to avoid are unintended consequences that make matters worse. But some might argue with me about the ways in which (or whether) things could get worse in the current presidential nomination system. Hat tip to Matthew Shugart over at Fruits and Votes for the link.